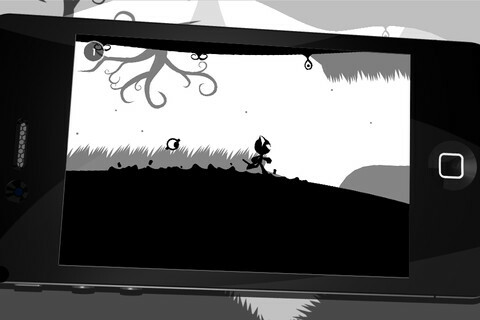 Have you ever wondered what it would be like if Tim Burton created a gaming app starring Felix the Cat? I didn’t think so. I’d wager that wasn’t what the good folks at Blue Shadow Games were going for either but it’s not too far from what they ended up with. 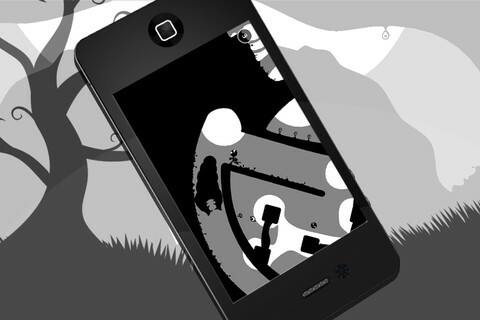 Naught is a platform/adventure game for the iPad, iPhone and iPod Touch. Like the theme of Beethoven’s Fifth or the Pyramids of Egypt Naught starts with relatively simple motifs and ends up with something special. Although Naught doesn’t quite distinguish itself as a seminal achievement of human potential it does offer a stylish, innovative, and very enjoyable new game. In Naught you control a bipedal cat by rotating gravity in a full 360 degree range of motion to maneuver past obstacles and adversaries presented in each level. Using your device’s gyroscope Naught allows you to dictate which way to rotate gravity by tilting your device in the direction you wish to move. Flip your device upside down and you’ll be standing on what used to be the ceiling, or turn it 90 degrees to fall down the hallway you were previously standing on. If the gyroscope controls are not to your liking then there are two other screen or butting tapping control options which can be readily switched to. As fun as it may be to tilt your device back and forth the game is quite a bit easier using either of the other two control options. The controls are much more responsive that way, which makes sense considering how much faster you can tap the screen as opposed to tilting your iPad from side to side. Visually enough can’t be said about how sleek and polished Naught looks. From the very start Naught grabs you with its minimal aesthetic. The game is entirely in black in white, but you won’t miss the lack of color for a second, at least until it gets you killed. Despite how much you may be blown away by the overall look of Naught the ocular appeal comes at a cost to gameplay. With such little distinction between terrain it is often difficult to distinguish the various hazards you come across. In fact there were a number of times where I just had to die to realize I wasn’t supposed to make contact with something. This can get a bit annoying but you do learn quickly, and soon enough you’ll be ignoring that weird, wiggly, apparently dangerous black thing like a pro. With its clever gameplay and extraordinary visuals Naught offers a great game worth checking out. The slight hindrance to gameplay for the sake of visual design is definitely excusable. The first five levels are free, and at $0.99 the next fifteen levels are certainly worth it as well. Developer: Blue Shadow Games S.L. AppSafari review of Naught was written by Neema Akhtar on September 8th, 2011 and categorized under Adventure, App Store, Arcade, Games, iPad apps, Physics Based, Universal. Page viewed 5121 times, 1 so far today. Need help on using these apps? Please read the Help Page.